Included among the owners and occupants of 109, 113, 115 & 117 Church Road from 1850 to 1900 are the following. We have already touched on Atherton and Gabriel of Calne, the solicitors, when looking at John Gabriel. 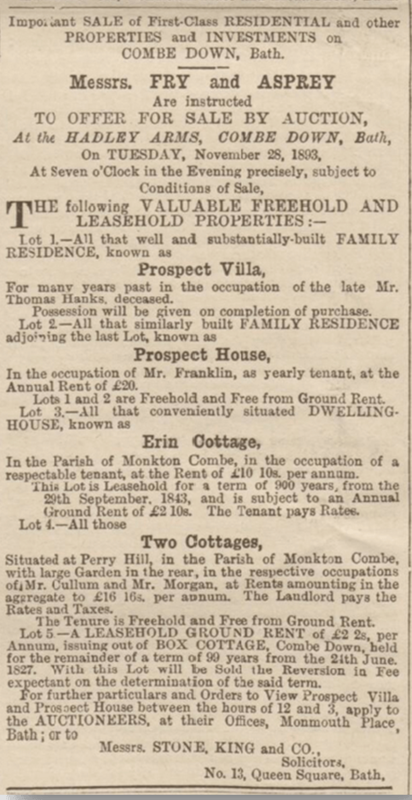 A deed, about the sale of the freehold ground rents in 1919, mentions that Nathan Atherton sold those for 109 and 113 to Thomas Hanks in 1861. There was a line of Nathan Athertons – Nathan Atherton (1750 – 1819), Nathan Atherton (1775 – 1831) and Nathan Atherton (1798 – 1885). At least the last two were solicitors and it is likely that Nathan Atherton (1798 – 1885) was the part owner of 109 and 113 before 1861. He was married twice, first to Sabrina Poole Bernard (1799 – 1829) with whom he had three children and secondly to Harriett Eliza Compton (1797 – 1880) with whom he had eight children. His first wife was the daughter of David Bernard (1758 – 1804) of Bona Vista in St. James, Jamaica. He owned 107 slaves. There are memorials to the Bernard family in Clifton Church in Bristol. 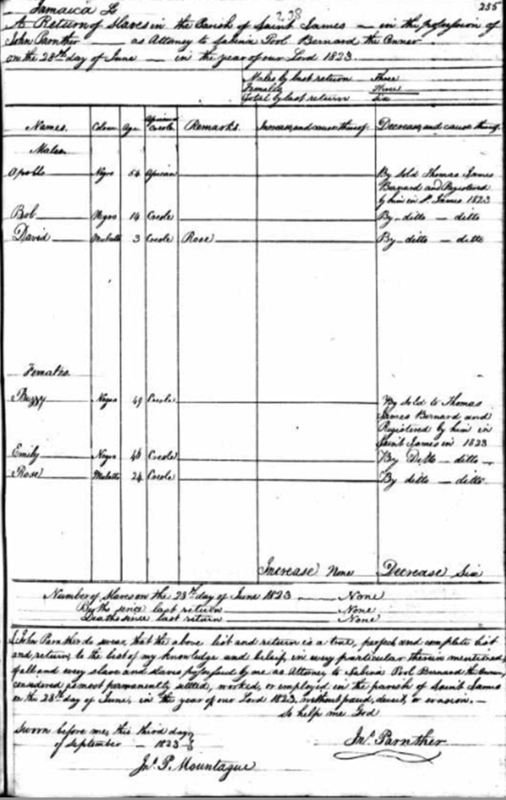 His wife owned slaves too, as Slave Registers of former British Colonial Dependencies, 1812-1834 shows. His daughter Sabina Pool Atherton (1828 – 1913) married John Gabriel’s son Charles Henry Gabriel (1821 – 1900) thus bringing the two families together. "Lower Whitley farm was acquired, apparently by purchase, by Nathan Atherton c. 1826. In 1841 Atherton sold the farm, 137 a., to Henry, Marquess of Lansdowne, and it descended with Bowood House until 1919, when Henry, Marquess of Lansdowne, sold it to F. G. Freeth." His brother Charles Atherton (1805 – 1875) was a marine engineer and became Chief Engineer at Woolwich Dockyard and then Devonport. Edward Palethorpe, who we have already met, lived in 109 from the 1850s to the 1890s and he was followed in 1893 by Henry Grahame Montagu (1829 – 1916). Henry Grahame Montagu may have been born in London or Kent, both are on the census as are dates of 1829, 1839 and 1846. One of his marriage certificates states that his father was Charles but it seems more likely that he was also called Henry Graham Montagu (1801 – 1872). If so, it’s possible that he was something of a chancer as a Henry Graham Montagu (48) was sentenced to 7 years transportation in 1852 for unlawfully obtaining £11 of John Jones, and £9 of James Gowland, by false pretenses. At the time of his conviction he was married to Lily Amelia Cunningham Reece (1822 – 1889). I have not established if he was transported or where, if he was, but by 1863 it seems he was back with Lily Amelia Cunningham Reece as they had another child Albert William George Montague (1863 – 1949). It is very unlikely that Lily Amelia Cunningham Reece was the mother of Henry Grahame Montagu (1829 – 1916) as she is said to have been born in 1822. Henry Grahame Montagu (1829 – 1916) was married at least four times and had 22 children. There is a record of a Henry G Montegue claiming to be born in 1829 fathering several children with Emma Dellar (born 1831), a school teacher, between 1857 to 1860 including another Henry G Montegue (born 1857) though a marriage record has not been found. He had 8 children with his first wife Louisa Maria Jenkins (1845 – 1890) whom he married in 1861 and who died on October 17th 1890. They had a son, also called Henry Graham Montagu (1862 – 1942) who lived at 113 Church Road from 1932. Their daughter Ethel Montagu (1871 – 1919) was the second wife of John Cunningham (1846 – 1930) who had been married to Maria Howard (1848 – 1896) the daughter of Rev Thomas Henry Howard (1804 – 1885) who was vicar of Warmley from 1860 – 1885 and two of whose brothers were married to daughters of Rev Reginald Guy Bryan (1819 – 1912), Principal at Monkton Combe School from 1875 until 1900. 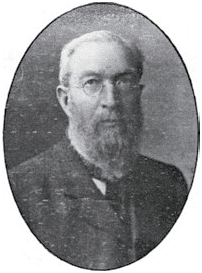 Rev Charles Howard (1853 – 1928) married Helen Gertrude Bryan (1860 – 1917) and Rev Alfred Howard (1857 – 1945) married Edith Mary Marow Bryan (1866 – 1951). Rev Thomas Henry Howard‘s son Rev Richard Nelson Howard (1852 – 1932) was vicar of Combe Down from 1892 – 1897. The Howard family were also related to Rev Alfred Richardson (1853 – 1925) was vicar of Combe Down from 1902 – 1914. The Bryan family were related to the Gore family via Caroline Letitia Gore (1843 – 1920) the third wife of Rev Reginald Guy Bryan (1819 – 1912). The Bryan family lived at De Montalt Place amongst others. The Gore family were also related to the Daubeny / Daubeney family via Edith Henrietta Gore (1852 – 1931) Caroline’s sister and wife to Capt Charles William Daubeney (1860 – 1937). The Daubeney’s lived at The Brow. With his next marriage Henry Graham Montague also linked his family to the Fortt family. 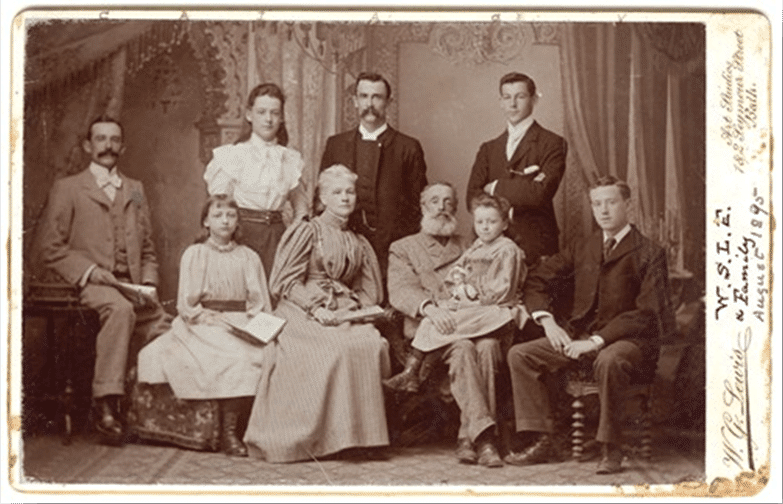 He had 5 children with his second wife Gertrude Kate Fortt (1872 – 1900), who died on January 12th 1900 from heart failure. Gertrude Fortt’s great uncle was William Fortt (1796 – 1880) who lived at Hopecote or rather 1 Claremont Buildings as it was then. His third wife was Eliza Perrot (1842 – 1907), who was 56 at the time of the marriage on 12th May 1902. He had 5 children with his fourth wife Elizabeth Tucker (1882 – 1950) who he married in 1909 and who he had probably met in 1901 in a boarding house in Bristol; certainly they were both boarders there according to the census. However, he had 4 of those children from 1902 to 1907 with Elizabeth Tucker whilst married to Eliza Perrot. As the obituary shows Henry Grahame Montagu had been a military man serving in the Crimean War, and at the Indian Mutiny. He had reached the rank of Sergeant Major. Given this rank and the fact that the Crimean War lasted from 1853 to 1856 it’s very unlikely that anyone born in 1839 or 1846 would even have served so I lean towards about 1829 as his birth date meaning he would have been about 23 – 27 during the conflict. There are quite a number of references to his activities in the Bath Chronicle, during his time as Inspector covering bad milk, bad meat, bad beer, child cruelty, scarlet fever and more. Frederick Mines (1797 – 1876) and his wife Elizabeth Poulson (1830 – 1889) occupied 113. They were there from about 1850 until his death and Elizabeth continued to occupy the house until at least 1883 and probably until her death. Frederick was a carpenter and previuosly married to Harriet Singer (1801 – 1846) and Sarah Hanney (1798 – 1859) marrying Elizabeth in 1859 when he was in his sixties but his wife was not yet 20. They had one son, Benjamin (1860 – 1884). It is clear from the censuses that they took in lodgers. When she died on 1st April 1889 Elizabeth left £82 14s in her estate. William Seward LeFeuvre (1833 – 1901) was born at South Stoneham near Southampton. His family was originally Jersaise and many LeFeuvres are known to have been involved in Jersey’s trade via Southampton for many years. After serving in the military he went out to Ceylon for over 20 years as a Superintendent of Police and Assistant Inspector of Prisons before retiring to Combe Down in about 1890. During this time he became involved with parish matters and was partially responsible for the wall letter box being installed near the Hadley Arms. He and his wife left Combe Down in about 1898 and moved to Ventnor on the Isle of Wight, when Jessie Palethorpe sold 113 to John Cook. He had married Rosina Jane Keele (1833 – 1866) married Jane Dodsworth (1849 – 1920) in 1868 when she was 19. She had been born in Ceylon to Dr. Benjamin Dodworth and Jane Eliza Walbeoff (d.1853) whose father was Superintendent of Cinnamon Plantations in Ceylon.They had 7 children. Jemima Harris (1799 – 1870) was living at 115 in 1864 – 1865, after Margaretta (Bull Taylor) was forced to sell to Thomas Cruttwell in trust for Thomas Hanks, but nothing is known about her. He must have done rather well as he left £8,929 18s 6d later resworn to £9,460 1s 5d in his will. Thomas Hanks (1816 – 1893) and Mary Ann Rebecca Hague (1832 – 1910) owned both 115 and 117 having bought them in 1862 (in trust with Thomas Cruttwell) after Margaretta (Bull Taylor) was forced to sell for debts. They paid £380 for the two houses. Initially they rented out number 115 as well as 117, but after 1881 came to live at 115. They are listed there in the Kelly’s Directory of 1883. They also part owned the freeholds of 109 and 113. Thomas was the youngest son from a local Bradford on Avon family. In his early life he seems to have farmed. There was a Thomas Hanks leasing the Bearfield estate at Bradford for £200 p.a. 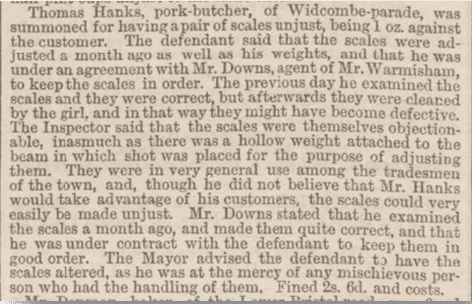 mentioned in a sale notice in the Bath Chronicle of Thursday 7th June 1849. However there is also a Thomas Hanks who is a butcher mentioned in the Bradford Directory for 1848 and we know that Thomas was a pork butcher in later life. It’s possible he combined both. He married Mary Ann in 1862 when he was 46 and she was 30. She was the daughter of Joshua Hague (1802 – 1883) who was the landlord of the Malt and Hops pub in Corn Street and later the Stag’s Head at 4 Widcombe Parade. 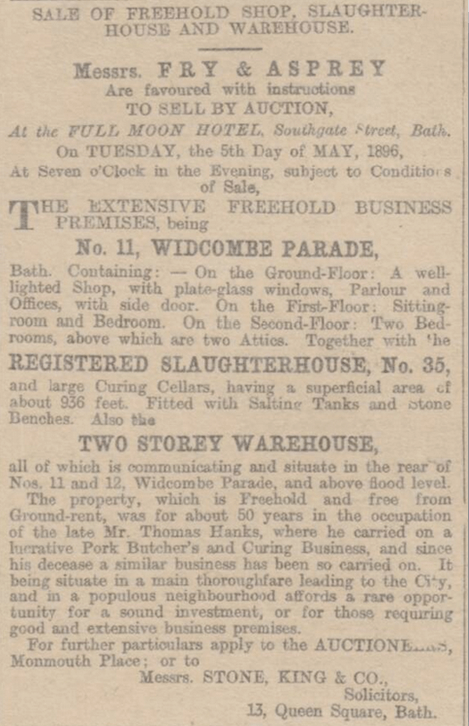 It’s likely that the Stag’s Head is where they met as he had a shop, slaughterhouse and warehouse at 11 & 12 Widcombe Parade – which we know from the auction notice after he died in the Bath Chronicle of 16th April 1896 – and in 1865 was fined 2s 6d for ‘unjust scales’ – though it’s clear from the tone of the article that he was not the only one with such a problem. After he died in 1893 his properties in Bath were sold and Mary Ann went to live in Weston super Mare. When she died in 1910 her estate was worth £8,012 16s 1d. Robert Vezey (1800 – 1866) and his wife Ann Brown Becket (1802 – 1878) lived at 117 in 1861. He was a coach builder and harness maker, in partnership with his brother Edmund (1804 – 1872) in Longacre. His father Robert (1770 – 1826) had established the coach making business before him in about 1785 and initially worked with his elder brother John (1799 – 1882). In 1823 he placed an advert stating their partnership was dissolved. John went to London and was still involved in coach making. After his father died Robert and Edmund continued the business and they were coach makers to Her Majesty Queen Victoria and to the King of Sweden. They won a number of awards, getting a medal with honourable mention at the Great Exhibition of 1851 for a ‘Sociable’, a bicycle that supports two riders who sit side by side. They also received an honourable mention at the International Exhibition of 1862 and were awarded a gold medal for their Victorias at the Calcutta International Exhibition 1883 – 1884. They employed about 50 people. The business ceased to trade in 1908 when it was bought by rival S. & A. Fuller of Kingsmead and Monmouth Street, who sold the stock and premises at auction on March 9th and 10th. Robert Vezey Snr.’s wife Elizabeth Read (1775 – 1858) ran a lace warehouse and was a milliner in Milsom Street and is listed in Gyes of 1819 as ‘Milliner to Her Majesty’. Robert Vezey served on the Town Council for Walcot Ward and also, for many years, on the Bath Board of Guardians. Priscilla Peacock was living at 117 in 1864 – 1865 but no more has been discovered about her other than that she ran a girls school. Robert Mattingley (1841 – 1871) and Maria Scammell (1841 – 1921) lived at 117 in 1871. See Combe Down cousin coincidence in the blog! A Thomas or Henry T. Jennings lived at 117 from 1875 – 1877. There was a Henry T. Jennings who was an agent in Bath for the Eagle and Palladium Insurance Company but no more has been discovered about him. William Portman (1834 – 1919) and Martha Bennett (1839 – 1932) lived at 117 from 1881 or before until at least 1885 and he seems to have traded in hats, but no more has been discovered about them. A Charles Davis was living at 117 in 1889 but no more has been discovered about him. Thomas Jones (1844 – 1902) and Mary Elizabeth Brown (1846 – 1929) bought both 115 and 117 in 1894 from Mary Ann Rebecca Hague, Thomas Hanks’ widow, for £550. Thomas Jones was a nurseryman and market gardener born in Corwen, Merionethshire in North Wales and owned Horsecombe Nurseries. They must have bought the properties as an investment as they do not appear ever to have lived at either house but at Horsecombe Vale. William Franklin (1852 – 1921) and his wife Emily Ridge (1836 – 1923) lived at 117 from 1893 to 1895 and have quite a story. William’s grandmother had died a pauper. His parents – it is not clear whether they ever married – had moved to Bath, an insanitary city, suffering an outbreak of cholera, and set up an eating house. In 1857, when William was only five, his father died of a heart condition that would have left him with a bloated face and body; but Charlotte, his mother, didn’t marry again and continued to run the refreshment house. William’s siblings went on to become a dressmaker, upholsterer and shop assistant but, by the time William was seventeen, he was advertising himself locally as a ‘Classical Tutor’ who would visit homes for private tuition. How he received his education is a mystery. Bath Forum Free School, the Blue Coat School and King Edward’s School were nearby, but their registers do not mention him. His obituary suggests that a youthful illness prevented his attending Oxford, but this seems unlikely, as we know that some time before 1873, William went to Bath Abbey to register as a private student at London University and then in January 1873 failed his Matriculation, a basic requirement before starting at the university. In 1874, while still tutoring, William joined the staff of Monkton Combe School. Two years later he married Emily, who was fifteen years older and had been a widow for ten years. She came from a landowning Irish family and was able to live off her own means, so was an attractive proposition but whether theirs was a love match or a marriage of convenience is unclear. They were looking after half a dozen boarders who lived with them at Claremont Villa in 1881. Emily had previously been married to John Blood Castle (1828 -1866) of Kilroughram, County Wexford. He had died on a trip to Canada leaving her with 3 daughters to bring up. Emily’s maternal grandfather was Samuel Gerrard (1767 – 1857) a Canadian fur trader, businessman, militia officer, justice of the peace, politician, and seigneur. Her paternal grandfather was Maj Robert Ridge (1764 – 1819) who served with Charles Cornwallis, 1st Marquess Cornwallis KG, PC (1738 – 1805). William founded Combe Down School in 1886. It moved to Weston super Mare in 1895, having grown too large for Combe Down, and was renamed Clarence School. It moved again in 1923, to Wimborne, becoming Canford School. "Conveyance of Prospect House and Prospect Villa from Mary Ann Rebecca Hanks (widow Combe Down), John Peter Stursberg (German moulding merchant of Forest Gate) and Henry Charles Stone (solicitor Bath) to Thomas Jones (Market Gardener of Bath). Price: £550." He was part owner of the freeholds of all four houses, though he lived in Essex, and an executor of Thomas Hanks because he was his brother in law, having married Emily Eliza Hague (1844- 1907), the sister of Mary Ann Rebecca Hague (1832 – 1910) in 1866. He was born in Prussia but became a naturalised British subject in 1869. In 1895 a Mrs. Grant was living at 117 but no more has been discovered about her. In 1898 John Cook (1841 – 1903) bought 113 from Jessie Palethorpe for £200. John Cook was a butcher who had previously lived and traded at 3 Prospect Place. He moved into 113 with his sister Sarah Ann Cook (1838 – 1915) and her husband Richard Henry Knott (1840 – 1907) who was a solicitor’s clerk. When John Cook died his will specified that his sister could live in the house until her death. After her death the house was to be sold and the money added to his residuary estate but Edward Richard Dolling (1852 – 1928) was to be allowed first refusal to purchase at a fixed price of £250 within six months of his sister’s death. Edward Dolling was an agent of a sub branch for Prescott Dimsdale, Cave Tugwell & Co. Limited bankers and lived at 1 De Montalt Place. 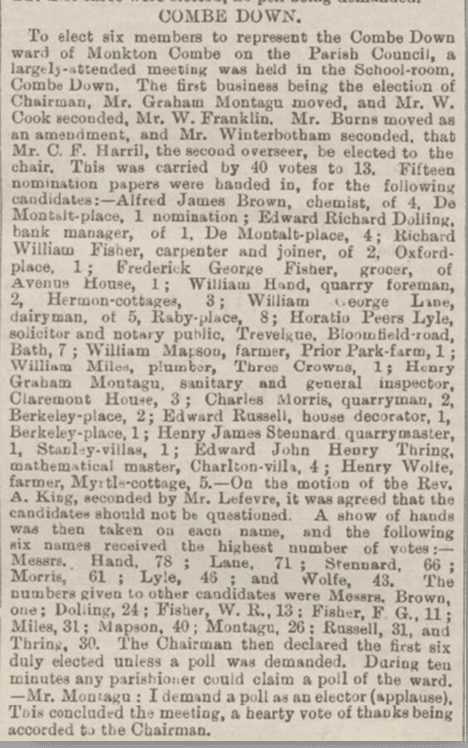 His name and some other familiar names are clear in the Parish Council elections from the Bath Chronicle, Wednesday 5th December 1894. Sarah Cook occupied 113 until her death. The National Archives reference HO 1/157/6238. Naturalisation Papers: Stursberg, John Peter, from Prussia. Certificate 6238 issued 30 June 1869.